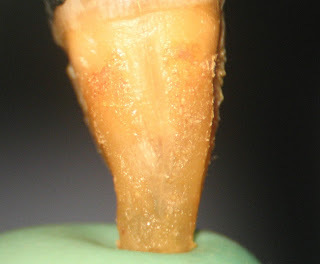 Vertical root fracture (VRF) can be one of the most challenging parts of endodontic diagnosis. It is often only diagnosed after you have ruled out everything else. Since treatment of a VRF is extraction, it is important to have an accurate diagnosis. The most certain way to diagnose a vertical root fracture is to see it. This is easily done with a microscope internally. However, that takes significant chair time. Here are a few tricks that will help you diagnose a VRF. Look closely at this radiograph. You can see a dark line running parallel to the canal. 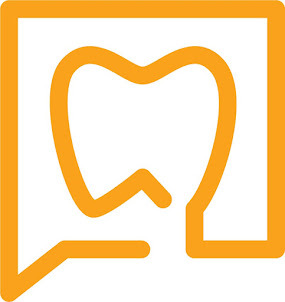 This dark line will appear if the fracture has caused the root to separate or if you just get lucky with the horizontal angle of your radiograph (just make sure it is not a missed canal). 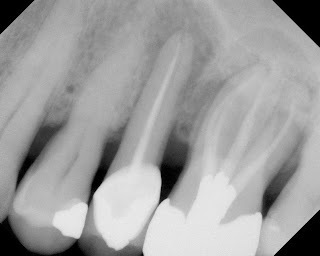 Long narrow periodontal probings are often indicative of a VRF. A long, narrow probing develops along the line of a fracture because the pdl cannot attach to the fracture. Looking closely at this image demonstrates the pdl breakdown along the line of the fracture. As you can tell, all of these tips still have some exception to them. Full, accurate diagnosis of VRF sometimes requires a couple of visits to rule out all of the other possibilities. Visualizing the fracture is best done internally with a microscope. However, if you find several of these signs together, you can be fairly confident that you have a VRF. Don't pull that tooth yet!